This imposing and very handsome structure was completed in 1897 to designs by Brunner & Tyron for the nation's oldest Jewish Congregation. "Like towering architectural counterpoints to the oaks across the street, four great Corinthian columns dominate the facade of this elaborate Orthodox synagogue. And the neo-Classicism is more than skin deep. Even the Ark, carved in tawny Siena marble and framed by butter-yellow Tiffany windows, has the broad pediment and Corinthian columns of Greco-Roman architecture. Congregation Shearith Israel (Remnant of Israel) doesn't go back quite that far. But it is the oldest Jewish congregation in North America. Shearith Israel traces itself to a group of 23 Jews, mosly Spanish and Portuguese, who came here from Recife, Brazil, in 1654. The oldest remaining physical trace of Shearith Israel is the tombstone of Benjamin Bueno de Mesquita, who died in 1683 and is buried in the congregation's tiny Chatham Square cemetery downtown....The second cemetery, established in 1805, still exists as a tiny patch on West 11th Street, just east of the Avenue of the Americas. The third cemetery, of 1829, can be found onWest 21st Street, just west of the Avenue of the Americas. 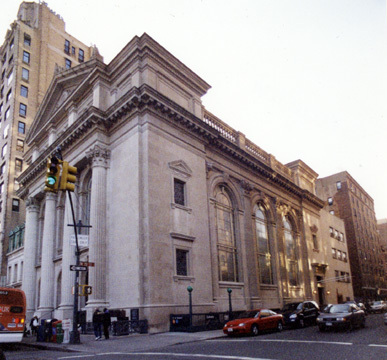 Shearith Israel's earliest synagogues stood on Mill Street, now known as South William Street....Until 1825, Shearith Israel was the only synagogue in New York. 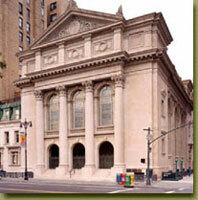 The congregation moved to Crosby Street in 1834 and to West 19th Street in 1860." Mr. Dunlap noted that "Contemporary discoveries of synagogue ruins in Galilee from the Greco-Roman period had stoked a neo-Classical boomlet in synagogue architecture, lending what the architect Arnold W. Brunner called the 'sanction of antiquity.'" In their superb book, "New York 1900, Metropolitan Architecture and Urbanism, 1890-1915," (Rizzoli International Publications, Inc., 1983), Robert A. M. Stern, Gregory Gilmartin and John Massengale maintain that the design of this structure "reflected the desire of established Jewish congregations to disassociate themselves from the Oriental or Near Eastern mode of synagogues typical of the Cosmopolitan Era (represented by the same architects' West End Synagogue on Eighty-second Street between Columbus and Amsterdam avenues). This rush to architectural assimilation was part of a widespread movement to distinguish Western European Jewish traditions from those of the East as large numbers of poorer Jews arrived from Eastern Europe between 1890 and 1914....Congregation Shearith Israel presented a boldly scaled temple front with a grand flight of steps to Central Park West." In early 2006, the city's Landmarks Preservation Commission approved an application for a certificate of appropriateness from the congregation to built a 10-story, mid-block addition that would contain expanded facilities and five condominium apartments. The design was by Platt Byard Dovell White. The plan was opposed by some community groups.